We’ve got a couple of great things coming up in the next week that I’m excited to tell you about. First, our guest on this week’s installment of our radio show “Dying to Talk” will be Lee Webster, President of the National Home Funeral Alliance. We’ll talk with her about the increase in home funerals. Home funerals are legal in every state, but in 10, a funeral director needs to be involved in some capacity. In New Hampshire, it is legal for a family or designated agent to handle everything without a funeral director. While there are no statistics about the number of home funerals, interest is growing. Ms. Webster told USA Today that the advocacy group has nearly 600 members, up from 350 one year ago. This is sure to be a fascinating topic. The episode airs Saturday, Nov. 21. 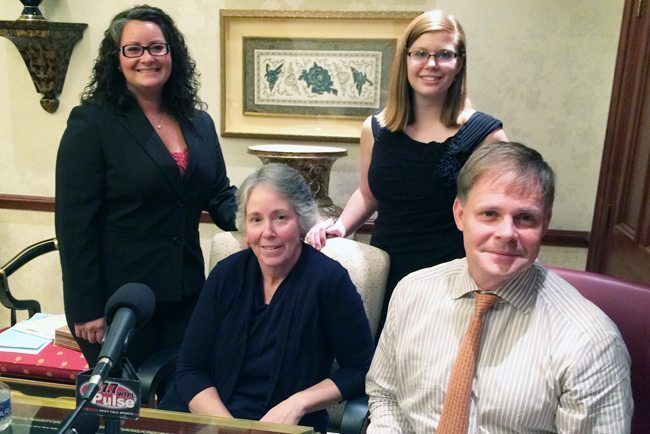 “Dying to Talk” airs every Saturday at 8 a.m. on 107.7 The Pulse. If you miss it, the show is rebroadcast on Sunday from 6:30 to 7 a.m. Please tune in! Podcasts of our previous shows can be found at http://www.wtplfm.com/. Nov. 28 – Barbara Sedoric, author of “The Lasting Matters Organizer,” will talk about leaving written final arrangement instructions for your family. Nov. 6 – Melanie Peffer, Director of the New England Organ Bank will talk about organ donations. The second event I want you to know about is our upcoming Lunch ‘n Learn event. Increasingly, people are planning their own final arrangements in order to spare their families much of the emotional and financial burden of a funeral and burial. At this event you’ll learn what you– or other family members – need in order to make these important decisions. The event is set for Wednesday, Nov. 18, at the Puritan Backroom Restaurant in Manchester, 245 Hooksett Road, from 1-2:30 p.m.
Because of limited seating, and RSVP is required. 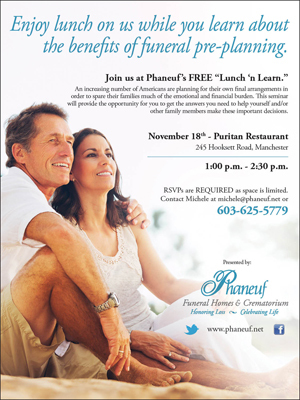 Contact Michele at michele@phaneuf.net or call 603-625-5779 to reserve a seat. Finally, yesterday we observed Veterans Day and we offer a belated thank you to all of those who served in the armed forces for your patriotism and willingness to serve. To honor our veterans, we can customize any funeral or cremation in order to take full advantage of the service and recognition benefits provided by the Veterans Administration free of charge. 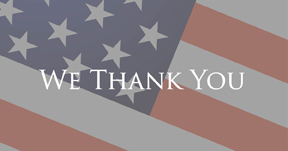 In addition, we offer a number of free products as our way of saying “thank you” to those who have proudly served our country. These include a military insignia on any wood or metal casket and a branch of service insignia on any urn. Research has shown that most veterans do not receive all of the benefits in which they are entitled. Our counselors are trained to handle every detail in making arrangements for veterans. Contact us for more information.